This debut novel by a British combat veteran chronicles a soldier’s maiming and recovery. [Parker's technique] can be disconcerting at first. The opening vignette is of a surgical bandage, and the reader struggles to identify it. But the technique gains steam and gives this highly autobiographical work a welcome degree of detachment ... While Mr. Parker is unsparing in building up to the moment when Barnes is nearly killed, it is his portrayal of what follows that will absorb most readers. This is one of the most intimate and detailed accounts of a wounded soldier’s recovery ever committed to paper. Parker’s narrative might jump from the chaos of an Afghan firefight to a Sainsbury’s car park and back again, but it never feels all that puzzling: his prose, economical but evocative and at times wincingly graphic, confidently shepherds you through the ruptured timeline. What might cause puzzlement, however, is his decision to rotate the first-person narrative voice not between characters, but between objects involved in Captain Barnes’s story ... Would the book be more successful if Parker had chosen a different narrative method? I think so. But considered apart from its executional difficulties, Parker’s decision to let the objects around Barnes do the talking makes a lot of sense. After all, Barnes is himself an object for much of the book. Parker’s narrative strategy is as ambitious as it is bizarre: a chorus of 45 inanimate objects, ranging from a catheter in a hospital to a pair of shoes to a tourniquet, a bullet and even an IED, tell his story and help to universalize his trauma. The device is mostly powerful, allowing him to access scenes of extreme emotional intensity while avoiding sentimentality or self-pity ... Anatomy of a Soldier amounts to an unusually worthy addition to the growing body of veteran literature being produced by some of the men and women who have borne the brunt of the Coalition of the Willing’s forays into the Middle East. 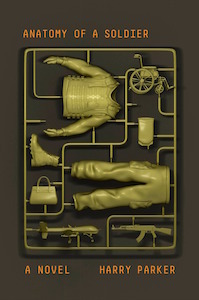 What did you think of Anatomy of a Soldier?